New job started today. Looks like its going to be really interesting. Anyway, expect short posts this week until I get my feet under me and am no longer adjusting to getting up a bit earlier. My office is a curious shade of green. It's sort of like the same green as Jamie's home office, but a smidge brighter. I also have huge windows that open onto... a long, white hallway. Luckily, I also have mini-blinds which I will never open. My office is in the basement level of a huge, windowless building (UT people will remember the PCL as a large, cement block). I have need of going up two flights (long flights, if you recall PCL) ona frequent basis, so I will try to use the stairs and see if I cannot become slightly more healthy. Also, my bosses seem cool. Smart, smart guys and they've got a plan I can get behind. The guys I'm sharing space with in the basement are both pretty cool so far, too. 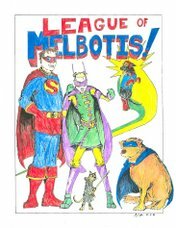 I haven't really updated the League of Melbotis shop at Cafe Press in a long, long time. Mostly because I don't remember anyone actually buying anything from the shop. But I'm going to mess with the store again here fairly soon. After all, who doesn't want to think of League of Melbotis as a lifestyle product? When you think "League of Melbotis", what is the first thing that pops into your head? What might look good on the side of a coffee cup? What might be good on a t-shirt? In short... help me make a mint off your ideas. KOHS alumni and the Trinity crew will be interested to know Erica Sevigny (formerly Foster) and her husband, Scott, have welcomed a new lil' gangsta into the world. I hope Erica still found time for a good lunch. Bug will make a good mom. Plus, next week is her birthday. So happy B-day to 2/3rds of the Sevigny's. Stick this on a onesie and I'll buy one for Esmé. She's going to be 18-months in December. Make sure the appropriate size is available. glad to read this news about Erica....hadn't heard about her in a long time!! If there's any, any justice in the world, this kid will be henceforth called Bug, Jr., in honor of his mother! Congrats to you and your family, Bug! Congrats on the swanky office! So what exactly does the League do in said office? Still have no clue what your job is. So very close to Funny Papers...so very dangerous. You better not spend all your lunch money on wax lips and comic books! I am actually going to NOT go to Funny Papers. I am now a strictly Austin Books guy. Now, I do have a pallet of wax lips just sitting there in my office.